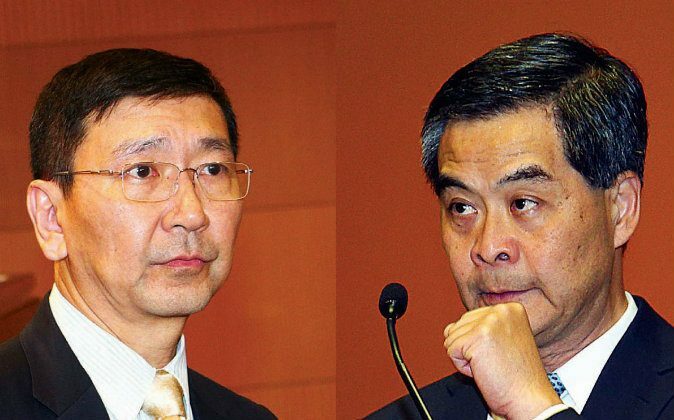 HONG KONG—Evidence has shown that Hong Kong Chief Executive Leung Chun-ying may have tried to prevent Johannes Chan Man-mun, former dean of the University of Hong Kong (HKU) Faculty of Law, from being elected pro vice-chancellor of the university. On Feb. 11, former chief editor of Ming Pao newspaper Lau Chun-to wrote an article titled “Denouncing Johannes Chan Man-mun Will Damage Interests of Both Mainland and Hong Kong.” According to the article, sources have indicated that the leftists were trying to obstruct Chan’s promotion as a way of punishing HKU for political reasons. Leung may also appoint one of his trusted followers to the HKU Council committee so they can set up a disciplinary team and wait for an opportunity to expel Benny Tai Yiu-ting, co-organizer of the Occupy Central pro-democracy movement. The purpose would be to prevent politically active staff members from taking part in civil disobedience, the article said. The Chief Executive’s Office responded on Feb. 12 that Lau’s report was not accurate. However, a number of media have quoted evidence to support Lau’s claim. Cable TV Hong Kong quoted a news source which said that at the end of last year, the HKU election committee unanimously recommended Johannes Chan to be the pro vice-chancellor. He was the only candidate recommended by the committee, but although two months have passed, the HKU Council has not yet put the matter on the agenda, the source said. The source also stated that Leung had made a phone call to the Council committee members and inquired about the relationship between Chan and the Occupy Central movement. Leung also asked if Chan was suitable for the position of pro vice-chancellor. Another news source stated that pro-Leung government officials contacted HKU regarding Chan’s pro-vice-chancellor position, including Central Policy Unit consultant Sophia Kao Ching-chi. When Radio Television Hong Kong (RTHK) asked her about it, Kao denied that she made initiative contact with Council committee members on the matter. However, she admitted that did not exclude discussion over a cup of tea. Dennis Kwok Wing-hang, a Civic Party Legal sector Legislative Council member, is a Senior Counsel and a HKU alumni. He said that he learned from two professors of the Faculty of Law that the Chief Executive and Executive Council had lobbied HKU Council committee members not to appoint Chan as pro vice-chancellor. “[The professors] wish me to act as a representative of the legal section, to work with others to defend the cornerstone of rule of law in Hong Kong. They do not want Hong Kong University to become a political wrestling venue,” Kwok said, adding that he had promised not to disclose their names. Kwok said that Chan had a very high support rate in the university. The election committee, the dean of major faculties, and Former Chief Justice Andrew Li Kwok-nang unanimously supported his promotion to pro vice-chancellor. Kwok criticized Leung’s government for intervening in HKU’s self government. “It obviously interfered with the school-based management system, and even worse, it made the university a political fighting place,” he said. Kwok said that the evidence very clearly points to systematic discrediting and exaggerated criticism against Chan. Before Leung became Chief Executive, he was chairman of the Council of City University of Hong Kong. He intervened with the university’s academic accreditation system and ordered that the doctoral status be restored to a mainland Chinese student whom the university found suspicious, Kwok said. As for the alleged involvement of Sophia Kao in Chan’s case, Kwok believes that her special position, in which high government appointments have to go through her, would make it a problem whether or not she took the initiative to talk with people about Chan. Kwok believes that the situation is very serious and he will continue to follow up on this. He thinks the government needs to give further explanation. Kwok hopes that people who are concerned about HKU and the core values of Hong Kong should stand up. He called on the HKU Council to vote according to their consciences. They criticized the Party mouthpiece for discrediting Chan out of context. They asked the government to talk and act cautiously and to respect the academic freedom of the universities, and they urged the state media to “self-respect.” As of 8pm Feb. 12, they collected nearly 750 signatures. A group of law faculty staff, alumni, and friends of HKU also made a joint submission criticizing the CCP mouthpiece’s “baseless exaggeration” about Chan. In addition, the HKU student association will issue a statement and make a joint submission asking HKU Council committee members to keep making decisions according to who is capable, without political interference. The students will also request that in order to set the record straight, all the meetings’ documents related to the matter should be made available to the public. Translated by Susan Wang. Written in English by Sally Appert.